Finally getting around to trying this. I bring in new skincare products slowly, but that's because, when you have skin problems such as being acne-prone, you should do it that way. It then becomes obvious if the new product aggravates your skin. I've been using their Cleansing Cream since September of last year. The Cleansing Cream was more important, as I'd already had in mind to find an exfoliating product of some sort. The idea of a mild cleanser...eh...I'd been using Johnson & Johnson Head to Toe Baby Wash to cleanse, and Heather Loraine jojoba butter to moisturize, for years. Recently I ran out of the J&J--it's cheap but goes fast--and, stealthily, began to substitute an old clear natural shampoo I'd fallen out of love with. It seemed to work just as well as an "official" facial cleanser. Then I remembered the Hauschka Cleansing Milk so thought I'd give it a whirl. So far: very interesting. It's moisturizing, where typically someone with oily acne-prone skin would gravitate toward a more astringent cleanser. It's almost too moisturizing, but then the Cleansing Cream is sort of like that. 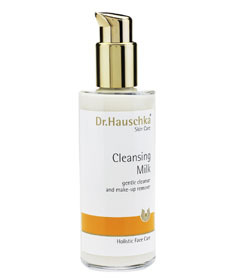 The Cleansing Milk is a white lotion-y substance which smells, like most of the Hauschka products, pleasantly herbal. It's almost like washing your face with lotion. Unlike the Cleansing Cream, which leaves a delicate film of oil after rinsing, the Cleansing Milk feels as if you've already applied moisturizer, after rinsing. That's where I feel it just might work. Instead of using the more astringent cleanser and then moisturizing, this would appear to do both. It's too soon to say about results...the Cleansing Cream took a while to kick in, and it's my philosophy anyway that good long-term skincare seldom works instantly. I can admit I'm a bit surprised something so moisturizing doesn't seem to have aggravated my acne-prone-ness one way or the other, but, as I say, it's too early. Interesting. The peanut oil in this product clogs my pores. Otherwise, I like it. I'll agree that you don't really need moisturizer afterwards. The spritz of a toner will do. In fact, that's how you are supposed to do it at night, according to the Dr. Hauschka regime, so that skin can "breathe". That might be why the cleansers have such a heaviness to them. Hey Colleen, you know that hoop design you've been working with lately? Have you considered looping it back down before you wrap it and making a small hoop that descends into the center? That way, you can attach a stone that floats in the middle of the large hoop, and whatever you like on the ring itself. It might be a way to tinker around with color combinations and not worry about the stones themselves knocking into each other. The funny part is, it doesn't leave my face greasy. When I'm using it, it feels like hand cream--after rinsing and drying, it doesn't feel different from my regular moisturizer. Possibly it's better for oily skin than for dry. I haven't bothered with the toner yet. I've used the cleansing milk for three nights now--I'm using it only at night, I use the cleansing cream in the AM. My skin does feel a bit softer and smoother. Ah, the quest for the handmade wire hoop. The thing is you can buy readymade components, but they'll look readymade, in the sense of being something anyone can buy. I'm not knocking it...I've been pondering getting some myself, like a round hammered silver link with tiny holes in it. The handmade ones are a bit tricky...you have to get it so it doesn't look bulky, since you have to get the thing to stay together using only wire. Recently I've been doing the double-looped wrap I saw on the SkyDreams Etsy site...it really does work better. The old top wrap had only one loop, which you used to wrap the other end of the wire. I was having a problem with the end of the wire popping out of the wrap if you pulled it. If you put a loop at the top of the end, it really can't pop out. What I'd need to do is bring the wrap itself down and terminate it in another loop. The hoop would have to be bigger of course but there's no reason it wouldn't work. Yeah, I figured that might be it. Dr. Hauschka, try as I might, never quite suited me. And I first scorned Jurlique as a Dr. Hauschka copycat, but it suits my skin far better. The toner is great--it's the only toner I'd actually recommend. It's somehow "more than toner". There's alcohol in it, plant alcohol, but IIRC is it's ethyl not isopropryl, as it is for so many products. There's just lovely botanicals floating around, and it smells wonderful, and like nothing else. (I'm talking about the Facial Toner, am allergic to Clarifying). It's weird eh? It seems to me the greatest fans of Hauschka are in fact those with oily skin and/or acne.